Raw data is at the heart of data forensics. 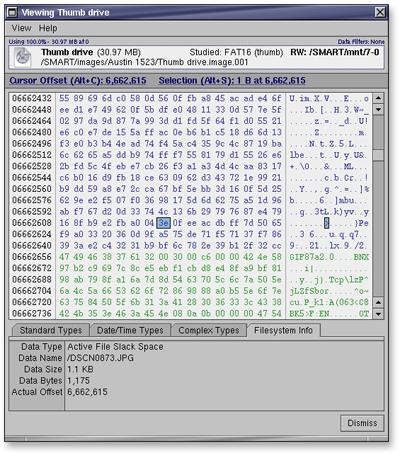 Hex viewing is essential, so it’s essential to have a good hex viewer. Arbitrary data selections can be hashed, exported, logged, etc. SMART’s raw data viewer can recognize certain data structures automatically. This screenshot shows the interpretation of a FAT directory entry. Filesystem study extends its functionality to the entire SMART UI. Here, a studied filesytem can be seen with color-coding. 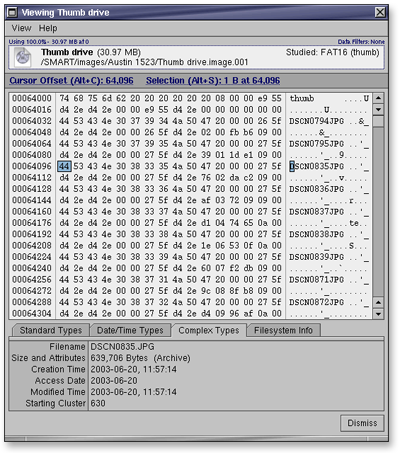 The blue area is slack space, and the green area is the start of the next file’s data allocation (a GIF file as you can tell by the signature).